View a photographic gallery of the event. 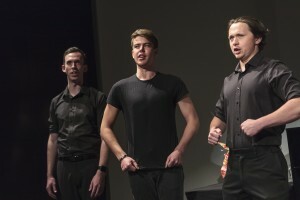 The film was a compilation of interviews with four young people who had researched, in various ways, the impact of the Great War, interspersed with readings performed by Graduate Actors of the Arts Academy, chosen by the performers themselves from texts provided by Ballarat-based historians. 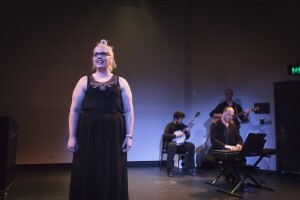 The live voices were complemented by a selection of historical photographs from local and international archival collections and with music of the WW1 era performed by the Graduating Actors of the Arts Academy. “Thanks for making me cry again, Jary and Lucinda,” said Ballarat RSL President Alex Tascas to the film’s producers as she got up to speak following the screening, a teasing reference to the producers’ previous collaboration with the RSL ‘In Memory of Bull Allen’. Ms Tascas gave an engaging and personal speech which began with her own experiences of Anzac Day. “I never used to go,” she said, “I’m of the Vietnam conflict generation. I was an Army nurse. I never used to march because I didn’t like the way Vietnam vets were treated.” But then, she said, she missed the camaraderie of her Army days and started to attend. 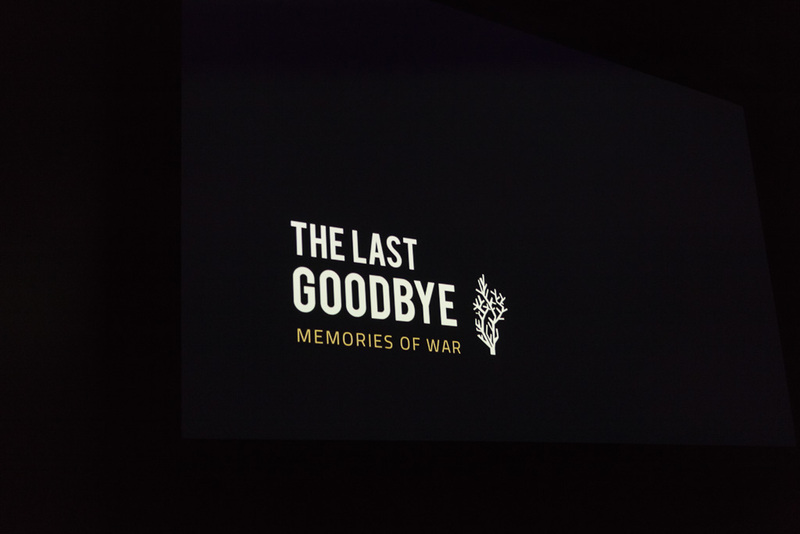 Alex went on to talk about the film, and explained it was part of a larger project collaboration between the RSL Ballarat, Federation University Australia, the Gold Museum, the Museum of Australian Democracy at Eureka and Wind & Sky Productions. 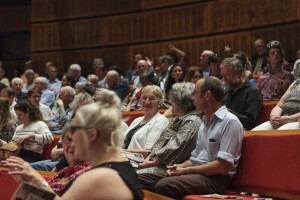 She talked about how the project connected university writing, history, drama and education staff and students with the Gold Museum World War One collection and to the project film-makers. But her talk was really a celebration of the efforts of the community in the commemorative year of 2015. For the RSL, she said, this had been an extraordinary year of engagement and connection. After Alex spoke the audience was treated to an extraordinary live performance. 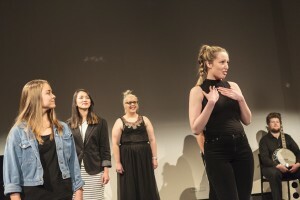 A small band of musicians began to play, and actor Casey Binks, a recent graduate of the Federation University Australia Arts Academy, who has the voice of an angel, walked to centre stage and sang an old World War One song ‘Are We Downhearted, No?’ with a plaintive, contemporary feel. As this beautiful song morphed into another World War One era favourite ‘Hold Your Hand Out Naughty Boy’, a choir joined her with singers from all sides of the theatre chiming in, bathing the audience in sound. These were Graduating Actors of the Arts Academy reprising some of the songs from their 2015 production ‘Oh What a Lovely War’, arranged and directed by Nathan Gilkes and Bryce Ives of Present Tense Ensemble. “It was superb,” said one audience member. “I had no idea there was going to be singing but it was perfect, a perfect surprise.” For the actors in the ensemble this was their last performance together as students of Federation University Australia in Ballarat. Now at the end of their graduating year, the actors were all dispersing into the next stage of their careers. “It was great, it was like getting the band back together for one last show,” said one performer. 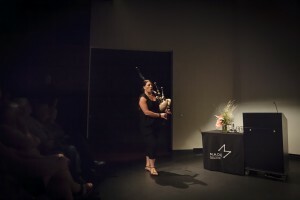 “How am I going to follow that?” said Jary Nemo, the film producer and project creative director who after the bagpipes ended got up to speak. “I’m here to thank everyone but I’m not going to bore you with thanking individually every one of the cast of hundreds who have collaborated on this project,” he said. 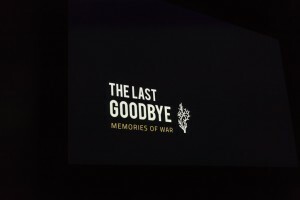 Then, “Oh hang on a moment, yes I am” and on the screen rolled a full list of the people who had worked on the film, the event and the ‘Memories of War’ project. As the credits scrolled, the actors came back on stage singing two more songs to the audience and so an incredible two year project ended with a massive round of applause. “The whole thing was seamless, the film, the performances, the speeches” said one person from the crowd. “It was so integrated” said another. “Nostalgic, but in a good way” added another member of the crowd. 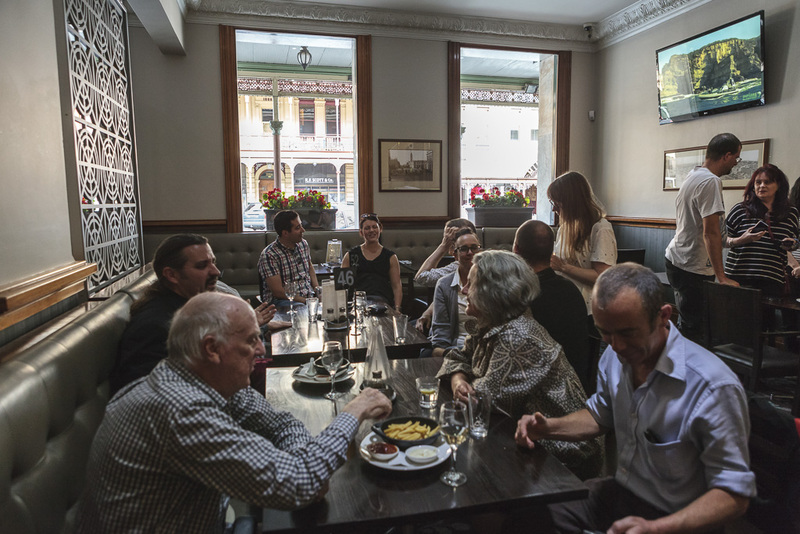 Project collaborator Bryce Ives described the event as a “thought-provoking and grounded community reflection.” “I don’t think Ballarat has seen anything like this before,” said RSL President Alex Tascas. 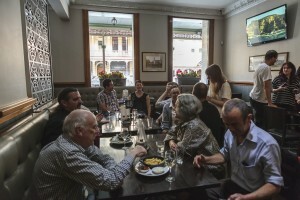 After the show the audience was invited to the George Hotel – home of the Ballarat RSL – for a complementary drink where they could mingle with project cast and crew. It was a relaxed wind down to an intense and moving show. Kayla Hamill and Alisha Eddy (foreground). J Photograph by Aldona Kmeic.